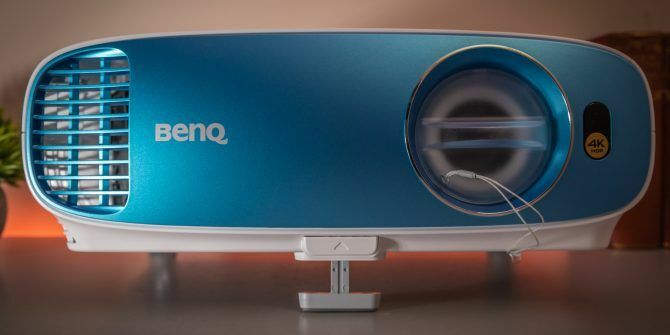 BenQ’s TK800 is a high-performance 4K HDR projector. Priced under $1500, this DLP projector is aimed at the sports entertainment market, so what better time to test it than during the soccer World Cup? Read on to see what we think of this projector (TL;DR: it’s awesome). With a bulb rated at 240W, the TK800 consumes a total of 330W when in use. It produces 33dB of acoustic noise and can comfortable produce a 300-inch image. This projector features analog audio in and out, analog video in through the VGA port, HDMI 2.0 and 1.4 ports, USB Type-A, USB Mini-B, RS-232, and a 12V trigger. This I/O may not be surprising—it is a projector after all, but there are some limitations here. First, the inclusion of VGA is baffling, as it’s not able to support 4K content. This makes it more versatile for those with older computers, but why bother buying a 4K projector if you’re going to use an analog video signal? The USB ports can’t be used to playback content; they are for servicing and USB power output for devices such as a Chromecast or Fire TV Stick. The 12V trigger and RS-232 ports can remotely control the projector or link up associated devices such as motorized projector screens. Finally, only one HDMI port supports HDMI 2.0 and HDCP 2.2. The only other HDMI port supports 1.4a with HDCP 1.4. It’s unclear why one uses an older standard, but if you need more HDMI 2.0 ports, you’ll need to use a switch box. The TK800 is capable of producing a cinema size 300-inch screen. That’s 25 diagonal feet of glorious 4K content. I was unable to test this out, as I don’t have a wall big enough. For me, 90 inches is the largest I was able to project while still being able to see the image. There is no noticeable reduction in sharpness or brightness, and images still look as sharp and vivid as when projected at much smaller sizes. If you’re looking for a home cinema projector, make sure you have enough room to place the projector far away from the screen. The throw ratio of 1.47 – 1.76 isn’t bad, but remember that to get a gigantic 300-inch screen will require you to sit the projector about 37 feet away. If you’re tight on space, you’ll want to look at a short throw projector instead. Like many other premium projectors on the market, the TK800 takes for the format of a “traditional” rectangular box. It has a locking port, adjustable feet, and bracket mounting holes. The lens cap is securely attached by a small lanyard, and the blue fascia differentiates the otherwise plain white exterior. Measuring 13.9 x 5.3 x 10.7 inches, this projector is larger than your average home projector, but about on par with many similar home cinema models. It weighs a manageable 9.2lbs. The single built-in 5W speaker reproduces sounds well enough for casual watching, but you’ll definitely want a dedicated surround sound system for the cinematic experience. If you’re aiming for a huge screen size, you’ll be too far away from the projector to even hear this speaker. Like all projectors, this kicks out a load of heat. This isn’t a problem for most users, just don’t block the right-hand vents. The internal fan can be noisy, but what projectors aren’t? All that screen size comes at a cost, but it’s not loud enough to drown out the speaker. Finally, the basic menu works well, but it can respond slowly sometimes. Although once you’ve done your first setup, you’ll rarely need to access the menu. Common tasks such as changing volume or input are instantaneous. Image quality from this projector is stunning. Thanks to the DLP sensor, and 4-segment RGBW color wheel, colors look bright and vivid. Animated content such as Big Buck Bunny looks outstanding. Video games running on 4K capable consoles Xbox one X, or PS4 Pro look equally amazing, and feel really immersive if you have the space for a huge screen. Some games can be on the dark side, so you will need to take the time to fine-tune your brightness and contrast settings for the best experience. It’s marketed as a sports projector for parties or outdoor barbecues, and indeed, the TK800 is brilliant for watching sports on. The 3000 lumens brightness is enough to melt your eyeballs indoors and is bright enough to see outdoors as well, as long as the screen isn’t in direct sunlight. With the world cup currently taking place as of writing, there’s been no shortage of matches to watch. Colors look spectacular, especially the green turf and the player’s kits. There’s no ghosting or stuttering either. You’ll have more trouble finding a reliable 4K football stream than you will get from this projector. It’s worth pointing out that this projector isn’t “true” 4K. It can handle a 4K input and output a 3840 x 2160 pixel image, but the native resolution of the sensor is less than 4K, at 2716 x 1528. This sensor uses a technology known as “XPR pixel shifting”. This cleverly moves the sensor really fast, to produce a larger resolution output than the sensor can handle on its own. It works very well and is the reason for the sub-$1500 price point. This may sound like cheating, but each pixel is individually addressable by the projector or digital input device, so it meets the required standards for a 4K display. If you’re put off by this, and would rather have a native 4K DLP sensor, then you’ll have to pay much more. Native 4K projector prices start around the $4000 range. Don’t forget to read out 4K streaming device comparison Chromecast Ultra vs. Apple TV 4K vs. Roku Ultra vs. Amazon Fire 4K: Which Is Best? Chromecast Ultra vs. Apple TV 4K vs. Roku Ultra vs. Amazon Fire 4K: Which Is Best? Which 4K streaming device should you buy? Let us help you decide between the Chromecast Ultra, the Apple TV 4K, the Roku Ultra, and the Amazon Fire TV 4K. Read More if you’re looking for a 4K device to go alongside your projector. Like any projector, the TK800 bulb only has a finite lifespan. Rated at 4000 hours in normal mode, 8000 hours in “SmartEco” mode, or 10,000 hours in economic mode. This lifespan is fantastic, and either eco mode is more than bright enough when using the projector for a movie night or with the lights off. If you’re using this projector outdoors, or indoors with bright sunlight coming in through the windows, you will need to use normal mode, or otherwise increase the brightness. The 4000 hours lamp life in normal mode is still very good for such a bright projector and will last approximately five years of two hours per day usage. Genuine replacement bulbs cost $250, which is reasonable given the projector cost and bulb life. This equates to about six cents per hour in normal mode, so put 12 cents in a jar every time you watch a movie and you’ll have the money in no time. The TK800 is worth every cent of the $1500 price tag. Support for 4K HDR content, outstanding colors, amazing brightness, and huge screen size are all fantastic features. This projector is the perfect choice for getting the IMAX experience at home How to Get the IMAX Experience in Your Living Room (On a Budget) How to Get the IMAX Experience in Your Living Room (On a Budget) Why do people still go to movie theaters? Some argue it's for innovations like IMAX, but this is a moot point when you can get the IMAX experience at home on a budget. Read More . Purists may not be happy with the way 4K content is displayed, And it can be tough to set up in a very small room, but these are only minor sticking points, which don’t detract from an amazing deal. Buy it now, you won’t regret it. With the price of the best 4K HDR TVs, it’s almost a no-brainer to purchase the TK800! Thanks to our friends at BenQ, we’ve got a brand new TK800 to give away. All you have to do is enter our giveaway contest below, and make sure you follow the instructions to gain some extra entries. Explore more about: 4K, MakeUseOf Giveaway, Projector. I recently purchased an 'el-cheapo' projector (IE: under $300), and, for every single reason you pointed out here, I was disappointed. Your review ticked every single box that I missed and didn't think of at the time when I bought it, since returning the projector I have been avidly looking for one that 'does it' for me... and... I think I found it!